Tania Stadsbader is a VEDA Ambassador and author of the book, “Dizzy Me” – a memoir about her journey to get a vestibular diagnosis. She’s heard it all, from hyperventilation to a brain tumour, and from laziness to Ménière’s syndrome. It took doctors almost 14 years to figure out why Tania Stadsbader felt so dizzy. Professor Dr Margie Sharpe has personally met and chatted to Tania about her story. She is encouraged by the determination and commitment shown by Tania in reaching out to others, to help reduce the barriers to a patient’s correct diagnosis. In fact, Professor Dr Margie Sharpe encourages all Doctors and Physiotherapists to reach a better understanding of these conditions for their own practice. She further suggests for example, organisations such as the Australian Medical Association make educational materials, sessions and learnings available to ensure better awareness within the medico industry. It is an unfortunate truth for some people to experience long journey’s before a correct diagnosis becomes evident. Before the age of 60, 30-40% of us are challenged by some form of vestibular disorder. Currently, under 25% of vestibular patients receive successful medical care. 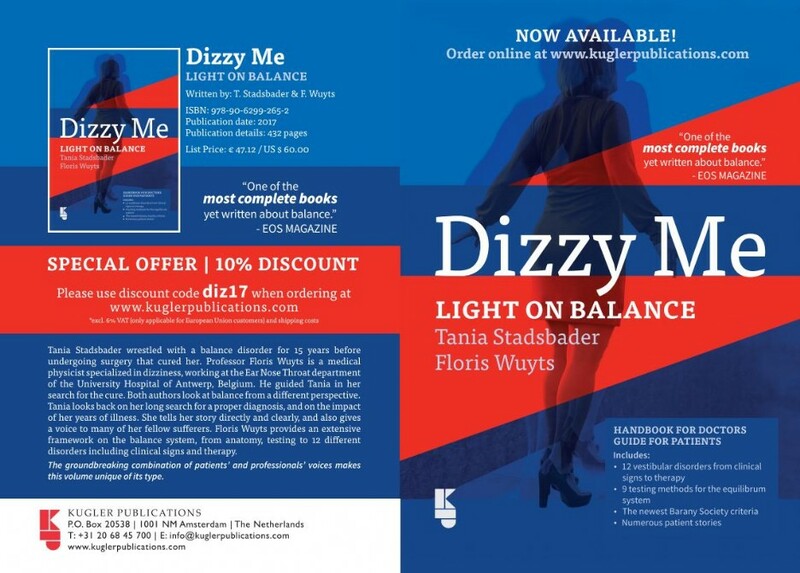 By writing the book Dizzy Me, Tania, and her co-author Professor Floris Wuyts have teamed up to endeavour to change this situation. Their book gathers knowledge about 12 vestibular conditions to make both diagnosis and treatment easier. Here is Tania’s story in her own words – and Margie thanks her immensely for this article. “I am a Belgian ex-patient who wrestled with BPPV (Benign Paroxysmal Position Vertigo) for 15 years before undergoing a canal plugging surgery that cured my balance disorder. The posterior semicircular canal is partitioned or plugged with small bone chips and human fibrinogen glue to stop the movement of endolymph and foreign particles within the canal so that the canal no longer sends false signals to the brain due to BPPV. Today I am 47 and healthy with a career, but I do realize I was very lucky to find someone who finally helped me. My BPPV started when I was 23 and only ended at the age of 38. But in 2008 I finally recovered 100% thanks to the surgery. It was Professor Floris Wuyts, a medical physicist specialized in dizziness who guided me in my search for the diagnosis and cure. Wuyts even guided me twice to the right diagnosis and treatment. In 2015 I underwent a nose and sinus surgery. As a result of the anesthesia and belladonna intake – which I did on own initiative because of the headaches – I experienced VP (Vestibular Paroxysmia) for 10 days. The underlying cause of Vestibular Paroxysmia is a neurovascular conflict, in which a blood vessel touches or compresses the vestibulocochlear nerve (N VIII). It was a horrible flash-back to my 15 years of illness. But this time I recovered very quickly thanks to immediate diagnosis. VP symptoms are repeated brief attacks of vertigo or dizziness, typically lasting a few seconds to several minutes and occurring several times a day. The attacks occur spontaneously or are triggered by certain head movements. The latter makes the entity difficult to distinguish from BPPV. Possible additional symptoms are short-lasting tinnitus and hearing loss. Between the attacks, mild to moderate hearing loss and balance may occur, which makes it difficult to distinguish from Ménière’s Disease (MD). Spontaneously occurring short spells of dizziness also occur with Vestibular Migraine (VM), making it even more challenging to diagnose VP correctly. My life story became my mission. As a change-maker in medicine and VEDA ambassador I now work with doctors and patients to raise awareness about all vestibular conditions. I wrote a book under the name Dizzy Me in which I look back on a long search for a proper diagnosis, the impact of 14 years of misdiagnosis and the 15 years of BPPV illness. I asked Floris Wuyts to become my co-author. “Dizzy Me. Shedding light on balance” Oct. 2017, Kügler Publications, ISBN 987-90-6299-265-2. Balance is controlled by the inner ear (vestibular system), the eyes (vision) and sense of touch. Treatment depends on your diagnosis. They say a picture is worth a thousand words. VEDA has combined pictures and words together to create an infographic that explains vestibular disorders in a nutshell. 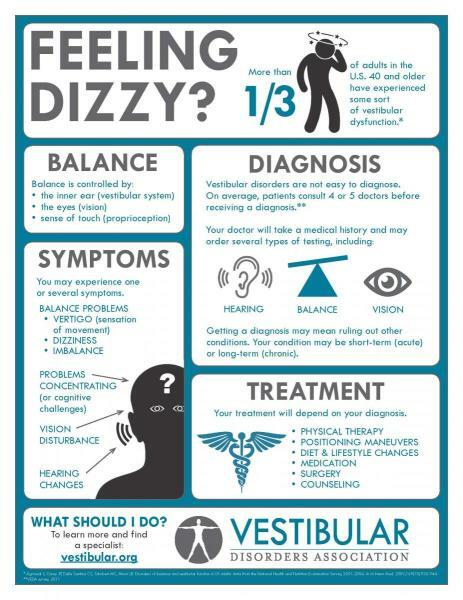 The goal of VEDA’s “Feeling Dizzy?” infographic is to raise awareness among people who may be experiencing vestibular symptoms but have not yet been diagnosed and may not know that there is treatment and support that could help them learn to cope with their condition. *Special thanks to Cindy Price for donating her time and talents to designing this infographic. Cindy is a vestibular patient who has suffered from superior canal dehiscence and perilymph fistula, and continues to struggle with many additional vestibular symptoms. You can learn more about Cindy’s journey by watching this video. What should you do next? The Dizziness & Balance Disorders Centre is dedicated to patients who do have or think they have vertigo, dizziness and unsteadiness. Professor Dr Margie H Sharpe is the Director and Principal of the Centre and the pioneer of Vestibular and Balance Rehabilitation in Australia. Note: Prof Dr Margie H Sharpe conducts individual consultations by appointment only.